It is a delicate moment for a brand when it comes to changing its creative director. Each designer carries a cultural background within, therefore it is inevitable that he will offer his own interpretation of the brand’s identity. A new era for Celine has begun at the latest Paris Fashion Week. A total identity makeover for the French house was brought by Hedi Slimane, who let prefigure his will to confer his personal imprint to the brand when he dropped the accent from its name (Céline) in the same manner he did in 2012 when he dropped “Yves” from Saint Laurent before taking the reins of it. What is primarily changing is the dialogue with the brand’s faithful customers: what modern women wanted from Celine fashion – an intellectual, minimal and clean-cut mature elegance – is now replaced by an aesthetic that blends rock’n roll, nocturnal youth and Los Angeles glamour, while indisputably Saint Laurent echoed in many looks. 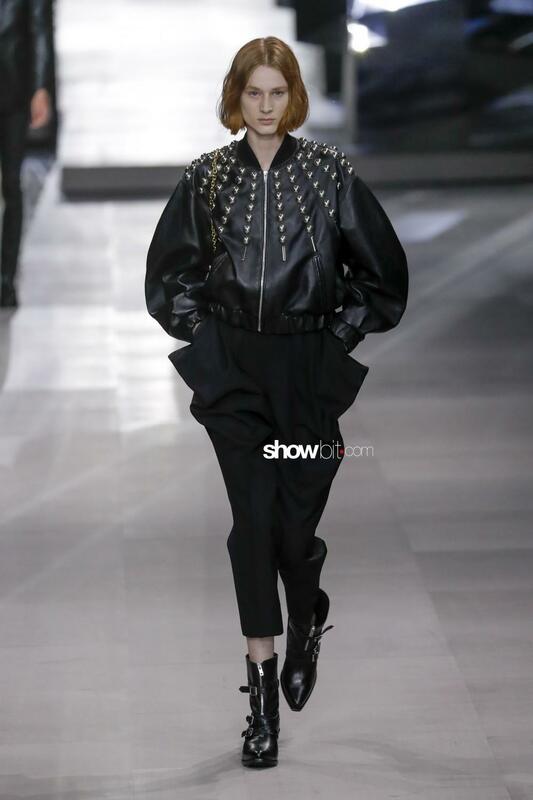 There is no connective thread between Slimane’s aesthetic and the former chief creative director Phoebe Philo‘s, and this couldn’t help but draw many critics towards the new director. This may be a safe move under the wings of the world’s largest luxury group as LVMH, but that will alienate the Céline habituées from the attention pedestal, in favor of the primacy of youth instead. The misfortune of Slimane was that of succeeding a woman who has been able to speak so intimately to the feminine clientele sharing emotionally and psychologically the identity of Celine since 2008. 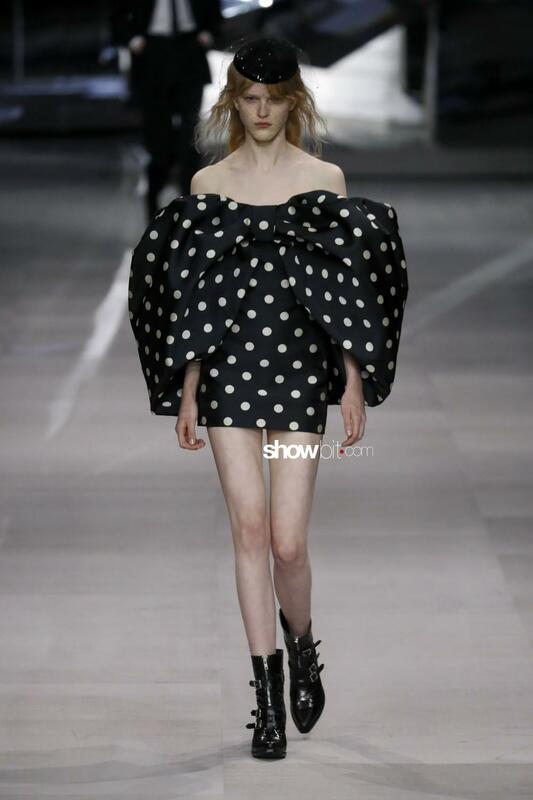 On the show notes, the title Journal Nocturne de la Jeunesse Parisienne summed up the taste of the show, that fully reflects the unique Hedi Slimane’s perspective. Night, party dresses, sparkles are the new tags, alongside black absolute: black tailoring, black leather, black shoes. 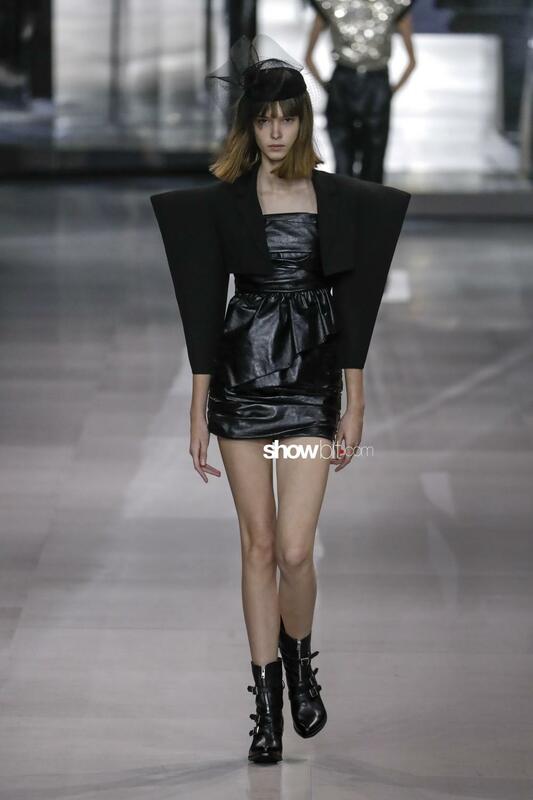 Leather is manipulated into rouches and draped dresses and skirts, while lengths shortened and gender boundaries blurred. 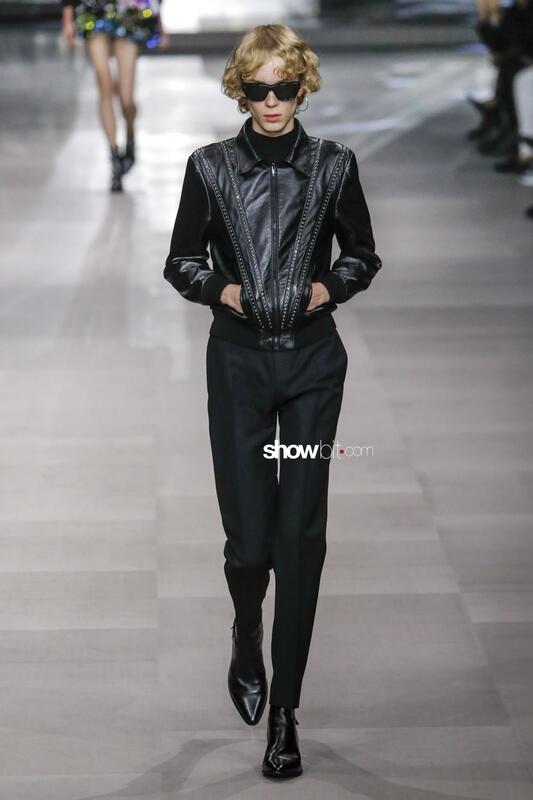 In fact, in the Spring 2019 co-ed show, many are the outfits that can be worn both by girls and boys, – as the suits with tie, the bomber jackets and the coats- as the androgynous campaign suggested on the Instagram page. Squirts of white, red and green, alongside gold and silver sparkles, break the monotony of the black.